This one is decidedly mixed. There is some good and some bad in the places we’ve come to expect. The headline came in at 164k, but the Private Sector actually added 168k as Government payrolls shed 4k. 168k is not stellar but well within most consensus ranges and keeps the 2018 average at 200k, but that is still on the strength of the incredible February numbers. If we adjust Feb to the average of the other three months the average drops to 160k, but the upward revision of 30k to the last two months helps the outlook. The Labor Force lost 236k, but the Number of Unemployed persons fell by the same amount. Still disappointing, in our view, the Participation Rate fell to 62.8. There are those “experts” interpreting that as evidence of tight labor conditions when coupled with the diminishing Labor Force. 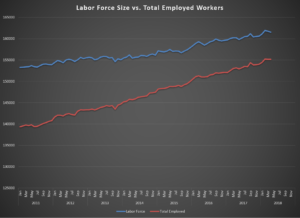 While we get it, we have to take the more cautious approach of noting that the rise in the Not in Labor Force total exceeds the drop in Labor Force size, and there is still no meaningful wage pressure, so we still lean negative on the notion that employment is so great that employers can’t find workers. That’s a tough sell. As we’ve pointed out in the past, there is no such thing as a “jobless recovery.” Add to that, “there is no such thing as full employment without wage inflation.” If employers are adding workers and not having to pay more for them then supply is likely still high. In the Blue World Economic Index® report, posted Monday, we expressed our view that today’s jobs report would be the dove/hawk tie-breaker for the next Fed meeting as the quarterly Employment Cost Index report signaled wage inflation, but the monthly Personal Income and Outlays report did not. Today’s report definitely corroborates Personal Income and Outlays, so let’s hope the hawks remain perched. The Diffusion Indexes are still comfortably above 50 but posted their second monthly decline in a row and have fallen below their year-ago marks. Manufacturing and Construction had good showings again with regard to payrolls and wages, with Construction jumping 3.7% and 4.2% for Hourly and Weekly pay year over year. If we were pressed we’d say this report is mixed with a positive lean, but you know we don’t care about any single report, anyway. We care about the trends. In a post from October of 2012 entitled “A Flute with no Holes is not a Flute and a Recovery Without Jobs is not a Recovery”, we compared labor market charts from past recession/recoveries going back to the 70’s to show how the trends in a true recovery look. If we look at today’s chart we can see there is, in fact, finally a robust recovery under way. Have a wonderful May and we look forward to posting the next Blue World Economic Index® report at the end of the month. This entry was posted in Analysis of Economic Reports, Blue World Blog Post, Blue World Economic Index, Blue World Entertainment Review and tagged Blue World Economic Index, business, capitalism, commerce, Economic Reports, Economy, Employment, entrepreneur, Experts, GDP, investment, taxes, Unemployment, Wealth by blueworldadmin. Bookmark the permalink.